Darrel Ralph Mid-Tech DDR Dominator 3.5 Bowie - Gold Anodized "Circuit"
This DDR Dominator features 0.180 inch thick 6Al4V titanium handles with Gold Anodizing and a "Circuit" design laser engraveded into the face of both sides.. Includes a titanium pocket clip with a satin finish. The CPM-S35VN steel blade has a satin finish and a plain cutting edge. The Dominator flipper knife was originally designed by Darrel Ralph for Camillus as a limited production run. DDR is excited to introduce a new custom line of Dominator flippers with titanium handles and CPM-S35VN steel blades. These hefty flippers utilize Darrel's Maxx Glide Pivot Bearing System with excellent results. Includes a DDR pouch. Pivot: Maxx Glide Caged Pivot Bearing System. In 1987 Darrel began making knives and the knife industry was forever changed for the better. His designs are not only artistry in motion but imagination come to life for those of us in love with cutting edge weapons. The first knife he ever made was a Butterfly patterned flipper. His first knife sale was five years later in 1992 at a knife show in Cincinnati. 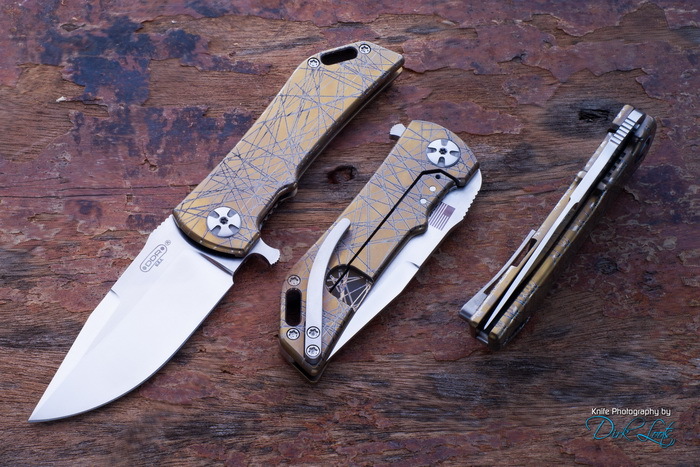 It would become the catalyst for over two decades of designs that would set the knife world on fire and raise the stakes for other custom knife makers. In a sense he turned up the pressure and lit a couple of fires in the tactical folder industry. His knives soon garnered the attention of the U.S. Government resulting in a contract to make switchblades for our greatest warrior sentinels in the military. Early on in Darrel’s journey he crossed paths with a legend in the knife industry, Jack Crider. Jack’s influence and close personal relationship, narrowed Darrel’s focus and led him to where he is today- at the top of the custom knife ladder. It was then that the most prolific knife designer and tactical knife maker alive was on course to change the industry. Most of Darrel’s knife making, until recently, was performed in his Ohio shop. Over the last decade the atmosphere in Ohio changed, becoming less like home and just politically unpleasant. The walls seemed to be closing in and he couldn’t quite put his finger on what had caused him to not produce a new knife design since 2007. It was rethinking a collaboration request for a knife, not unlike one on his drawing board from years back, that stoked the fires of ingenuity and determination and sealed his decision to move on. He realized that he was designing so many knives for other companies and individuals that he had lost some of his own independence. During this time he came to the conclusion that his not wanting to compete with the companies he was designing for was slowly chipping away at his desire to innovate. He was stagnate. He amicably parted ways with a number of the companies and decided to head west in search of a place for his renaissance. So he packed up the family, the shop, and moved to the great state of Texas. He has never looked back. The move has galvanized his determination to make the best knives in the industry. When asked why he chose Texas he always gives the same resounding answer, “FREEDOM”. Of his three sons, Ian was the one that insisted he be a part of this rebirth. He saw the determination in his Father’s eyes and actions and knew something epic was about to happen. He wanted to be an integral part of the growth. Once in Texas, the shop was setup, the team selected and hundreds of thousands of dollars spent on state of the art equipment. Darrel’s background in applied engineering was getting ready to have a serious workout. And what a run it has been to this point so far. Unbelievably profound designs are already making their way from the drawing board to the packaging and shipping departments. The waiting list on certain popular knives is already approaching a year. And growing rapidly. Darrel will still be making the full custom knives that we all know and respect. DDR will still be a separate company. Additionally, he’s gone from the drawing table to inception with the startup of DGT knives. DGT stands for “DDR Go Tactical” and will usher in a line of superior mid-tech knives that will rival other so-called customs. The name was inspired by Darrel’s other websites; “Go Pens”, “Go Accessories”, “Go Knives”, …you get the picture. This should be an exciting time for those of us that understand what we are getting when the package finally arrives from DDR, and now DGT. The quality will still be the finest in the industry, the innovation will continue to flow and the customer service will be without peer.